This week on the Cartoon Review we take a look at the most recent Young Justice episode Depths. So keep reading to check out what happened and see how the episode affected our reviewer! Nightwing puts together a squad to protect and ensure the safe launch of a new satellite to improve communications between Earth and Mars. This episode really flips the script so if you thought you knew what was going on then you are dead wrong. There’s one thing I want to discuss before I get to the big plot twist so I’ll save it for last. 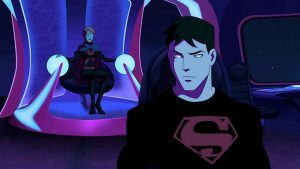 We find out exactly why Superboy broke up with Miss Martian. Apparently she was using her psychic abilities to extract intel from enemies which caused them to become catatonic. M’gann views this a simply doing the job, but Superboy thinks it’s unethical. It’s interesting to see how Superboy’s sense of morality has developed. I also find this new information quite frightening. This M’gaan is is very different from the sweet and bubbly M’gann of the first season. Then Superboy drops the bombshell that M’gann had attempted to use her abilities to try and make him forget he was upset about it. I’ve had it. I am done with M’gann. I cannot believe she did that. She completely abused her power and Superboy’s trust. I can’t forgive her for that. I honestly don’t care what happens to her at this point, but I have a feeling she’s going to become a darker character later on. At the end of the episode we find out that Kaldur has not actually turned evil, but has been working as a double agent. He’s been trying to gain the trust of Black Manta in order to get intel on the Light. I honestly did not see this coming and I’ve been waiting for them to revel why Kaldur turned against the team. Apparently, the only ones in on this plan are Nightwing, Artemis, Wally, and Kaldur. This raises a lot of questions. Why did they choose not to involve the league or anyone else on the team? Since Artemis and Wally are in on this, why did they retire from the superhero biz? What is the “secret” that only they know? I’m dying to know what’s going on.